“The eldest daughter is often doomed in fairy tales. But Bella-Isabella Beauchamps, daughter of a wealthy merchant-vows to escape the usual pitfalls. Anxious to avoid the traditional path, Bella dons a red cloak and ventures into the forbidden forest to consult with “Granny,” the local wisewoman. 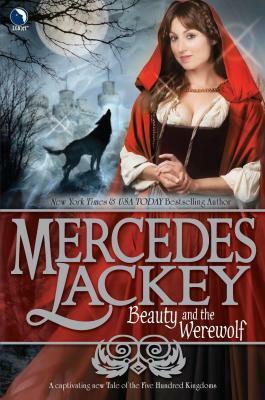 But on the way home she’s attacked by a wolf-who turns out to be a cursed nobleman. Secluded in his castle, Bella is torn between her family and this strange man who creates marvelous inventions and makes her laugh-when he isn’t howling at the moon. As with all of Mercedes Lackey’s “Tales of the Five Hundred Kingdom’s” novels – this book is a fantasy romance, but thick with adventure and fantasy with just a dash of the romance to make all those people with gushy hearts like me perfectly happy. Yes, it is technically one of a series but you could read it quite easily on its own. If you want to get a better look at one of the minor characters and the world that Lackey has created I would suggest reading “The Fairy Godmother” first. It is still my favourite of all the books in this series and will introduce you to… well… the Fairy Godmothers and a bit of backstory. The romance is relatively clean and the violence is only slightly graphic in a couple of scenes. There is some adult content for sure, but I would say that it would be fine for 16+. If you were introduced to fantasy romance on the urban side of things, and haven’t yet tried out true fantasy, or you’ve never read fantasy before, this series would be a good place to start. You have the comforting familiarity of fairy tales and romance but with a fantasy world to wrap it all up in. You can download the ebook on: Amazon, Kobo Books, Barnes & Noble and Ebooks.com. Or the paperback: Amazon, Barnes & Noble, BooksAMillion and Indigo Books. As a child, Sierra Brighton traveled the world. She swam with the baby whales, danced in storm funnels, and lived in complete magical freedom. And then Momma died and Sierra ended up in foster care, an unhappy and very secret witch. 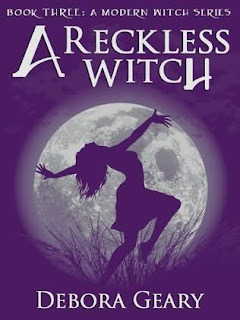 A Reckless Witch is another fabulous installment of the Modern Witch Series. Once again the focus is on a new character with the characters from the two previous novels playing pivotal roles. You get to see how their stories have evolved while at the same time being introduced to a whole new story in this witching world. This is a sweet story about magic, acceptance and finding your home. There are a few spots that left me sniffling… but they were the good kind of sniffles! Debora is very talented at writing a story that immerses you in the emotions of her characters. I have to point out yet again that these novels are great if you are looking for a clean read with elements of romance. The romance isn’t the focus, rather these books are all about character interaction. They will make you laugh and cry; I absolutely recommend this whole series. This was a fabulous read and I know that it will be not be last of her novels that I enjoy! NOTE: The series would be suitable for older teens. Find this novel, ebook or paperback, on Amazon. If you don’t have a kindle, Debora explains HERE why she only has her ebooks on Amazon and how you can read them anyway. This is the second book in the Modern Witch series, and it is one that I am really enjoying. Like the first it is a fun, entertaining read without the ridiculous amounts of ‘adult only’ scenes that so many urban fantasy novels contain. This book takes the ‘modern’ facet a whole step further, blending technology and magic closely together. It takes place shortly after A Modern Witch, but the characters are slightly different. It focuses more on characters that were a sideline in the first novel, though the originals, Lauren, Nat, Jessie, Nell, Aervyn and Ginia are all still in it with big roles to play. There is a lot going on in this novel; you need to pay a little more attention to which character is which but it is by no means mind-boggling. It still features Deborah’s easy writing style and wit, though I found myself on the verge of tears numerous times. A Hidden Witch tugs on the heartstrings and makes you hang on to every word. In Debora I have definitely discovered a fabulous author and I can’t wait to read more of her books. There is only one more in the Modern Witch series, but I believe there are some offshoots as well — I’ll have to look into it! “Elorie Shaw, steeped in the traditions of the Nova Scotia witching community, but not a witch. The fetching spell must have goofed this time… or did it? Travel to Fisher’s Cove, Nova Scotia, where Moira is matriarch and the old ways are nurtured and passed to the next generation. Where a crotchety old witch makes small children cry and builds walls around the silent pain in his heart. And where Elorie – sea-glass artist, inn owner, and Moira’s granddaughter – makes her home. If you don’t have a kindle, Debora explains HERE why she only has her books on Amazon and how you can read them anyway. “Can you live 28 years without discovering you’re a witch? I’ve been a little bit on the busy side for the last few weeks *understatement of the century*, so I decided to buy a book that would be nice and relaxing even though it wasn’t on my mile long list of books that I reeeeally must get to reading this month. As such, I was finally able to cross one of the books off of my ‘potential cures‘ list! I have to say it did a pretty good job of curing both my after-work exhaustion and any lingering boredom I may have been experiencing. Not to mention it isn’t about good vs evil, but rather about a witch finding her place in the modern world. Yay! It definitely added in a little bit of variety into a genre that is becoming more and more the same thing. The writing was great; easy to follow along, entertaining and humorous. I didn’t notice any typos or anything like that so if they were there they must have been few and far between. And bursting into giggles at the end? Can’t complain about that!! There are currently two sequels to this book; I have already purchased and begun the second! I would recommend this particular tonic to anyone who loves a good urban-fantasy, would like a change from the norm, and wouldn’t object to a nice clean plot. As for the rest, well you’ll just have to read it to find out! Find this ebook on Amazon.